Make no mistake about it, anything less than hoisting their first Stanley Cup will be a disappointment for the Buffalo Sabres. However, something has to be said for their great run to make it into the dance. Buffalo is surging at the right time and could be a tough first round opponent, but a lot lays in the balance of Tuesday night’s game against their counterpart in the race for 8th: The Washington Capitals. What they have done has been absolutely amazing, compiling win after win after win. Just over a month ago, they were talking in Western New York about the last place Sabres winning the draft lottery and the ‘fail for nail’ campaign. Now they have once again put together a run to end the regular season having gone 13-2-4 over a span of 19 games and the campaign they are hoping for involves a parade and a summer with Stanley. With just 6 games remaining, the Buffalo Sabres sit in 9th place, tied with the Capitals at 84 points. Washington currently holds the tie-breaker with 1 more victory than Buffalo. 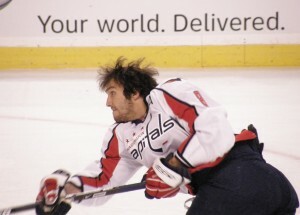 Tomorrow night’s tilt in the American capital is like every other game remaining for both teams: A must win. On the season, the Sabres are 2-1 against the Caps. Although both wins were lopsided, they were both at home. 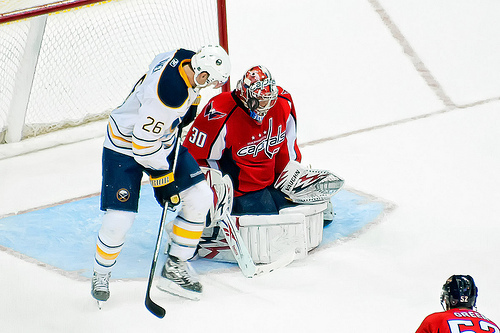 In their lone meeting in Washington, Buffalo succumbed by a 3-1 score. Tuesday night, These two clubs lay it all on the line in what is sure to be one of the best games of the season. Ryan Miller meets Alexander Ovechkin. “BRING IT ON”. The Ottawa Senators, the other team in this story, who sit in 7th place, have just 4 more points than the Caps and Sabres with 88 but with one less game left to play. The Sens helped themselves in two ways with their win on Monday night in Winnipeg. Firstly by gaining 2 valuable points in the race for the final 2 or 3 playoff spots, putting even more pressure on the New Jersey Devils. Secondly by pushing the Winnipeg Jets that much further down and keeping them out of the conversation. Although expectations for Ottawa were low to start the season, they have proven all pundits dead wrong. The Senators and their fans will be trying to find a way to watch the game on Tuesday as the two clubs immediately below them battle it out. They will be united in hoping for one thing. No 3 point games. So with all this talk about making the playoffs, let me ask you, could Buffalo oust the Sens for 7th place? I say yes. Washington: Buffalo, Boston, Montreal, Tampa Bay, Florida and finish the season in New York against the Rangers. It’s interesting to see that each of these teams will finish the year off against an Eastern Conference threat. It’s also interesting to see that the Boston Bruins who have sputtered a little bit since the all-star break, will play all 3 of these teams and could go a long way to influencing who they end up playing in the first round as they have all but locked up the 2nd spot. There’s no doubt that the Sabres have a tough go, but they have also played well against these teams. The key is beating up on Toronto, a team that could play spoiler. If you had plans for April 7th, cancel them. This will be an amazing day to watch hockey. Both Buffalo and Ottawa play afternoon games to end their season. Post game, they will find the closest TV set and watch as Washington faces off against the Eastern Conference’s best team at 630pm. Could it be their last match of the year. Who will they play if they make it? The Sabres have a real shot at finishing in either 7th or 8th place. 7th place would all but assure them of a matchup with the Big Bad Boston Bruins. 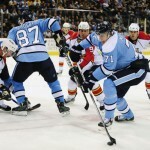 8th place would pit them against their cross state rival New York Rangers or the surging Pittsburgh Penguins. Who do they want to face in the first round? My intention is not to put the cart before the horse, but if the Sabres can finish the next 6 games like they’ve played the last 19, they will be assured of a spot and they will be tough to beat. They will have the advantage of having already been in a playoff push down the stretch and they have their star Ryan Miller back. Vs. Boston – You know what they say “Payback is a blank”. The Sabres, who own a 2-2-1 record vs the Bruins will be excited to take it to the Bruins. Do you remember this? Vs. Pittsburgh – Although it won’t be easy, the Penguins and Sabres are both playing their best hockey of the year right now. The Sabres are 2-1 against Pittsburgh this season and play again on Friday night. I can tell you that Ryan Miller does not wish to be in another Sidney Crosby highlight video. Vs. New York – New York is the best team in the East for a reason, but Buffalo has played them well with a 1-1-1-1 record in their four games. The Sabres lone victory came on Friday night by a score of 4-1 and the Sabres are the better team of late. Will it matter? So with Ryan Miller in fine form, Tyler Myers having served his suspension for a boneheaded play, Jason Pominville having an all-star season and the rest of the group ready to live up to pre-season expectations (see Ville Leino) could this be the year that the Sabres get 16 playoff wins? You’ll have to tune in.